← Big Finish Celebrates – Days 6, 7, 8, 9! When the Doctor, Charley and C’rizz find their journey through the Interzone interrupted by a nightmarish vision, they are surprised to find the Kro’ka offering the perfect solution. The Multihaven, a vast array of religions and faiths housed in one harmonious community, appears to offer the perfect sanctuary in which to convalesce. But under the guidance of the charismatic Laan Carder, one religion seems to be gathering disciples at an alarming rate. With the Doctor and Charley catching glimpses of an old friend and C’rizz on the receiving end of some unorthodox religious practices, their belief, hope and faith are about to be tested to the limit. On March 22, 2004, the BBC announced that Christopher Eccleston would be the new Doctor, as after fifteen years Doctor Who was back in production. While the fandom rejoiced, the questions that only a devoted and slightly rabid fanbase could consider began to pop up. Was this a reboot of the entire franchise, meaning Eccleston was the “First” Doctor? If not, which Doctor would Eccleston be? Would he be the Eighth Doctor after Sylvester McCoy? The Ninth Doctor after Paul McGann? Or even the Tenth Doctor after Richard E Grant in the web series The Scream of the Shalka? An even smaller portion of the fanbase, but one just as rabid, was asking a different question. What would this mean for Paul McGann, who had been portraying the Eighth Doctor in a series of Big Finish audios since 2001? And also, what would this mean for India Fisher and Edwardian adventuress Charlotte Pollard? At the time of the BBC’s announcement, the pair, along with Conrad Westmaas, were in the middle of a long-story arc that saw the trio trapped in the Divergent Universe, a universe where time as the Doctor knew it did not exist. Would the BBC insist that Big Finish stop using the Doctor (any of the Doctors) to avoid confusion with Christopher Eccleston’s Doctor? Would McGann’s Doctor be trapped in the Divergent Universe, forever without a proper ending? Luckily, the BBC let Big Finish keep the license for the pre-revival Doctors, which meant they could continue to tell tales starring the “Eighth” Doctor (the actual canonicity of McGann’s Doctor wouldn’t be set until Human Nature/The Family of Blood and reaffirmed in The Eleventh Hour) as well as the Fifth, Sixth, Seventh, and eventually the Fourth Doctor. On their end, Big Finish realized that they would need to conclude the Divergent Universe arc as not to confuse or possibly alienate any new listeners that the company picked up as a result of the revival, thanks to the sheer alien nature of the Divergent Universe. As such, two planned seasons had to be condensed into one season, with eight episodes put into four-and-a-half. Faith Stealer is the opening episode for the “fourth” season of the Eighth Doctor’s run. The Doctor, Charley, and C’Rizz find themselves in a unique city where all religions co-exist in peaceful harmony even as they scramble to convert the other’s followers. Mixing a bit of drama and a bit of humor, Faith Stealer is enjoyable without being preachy, a rare thing in any piece of fiction involving religion, and serves as the perfect opener for the final part of the Divergent Universe saga. Graham Duff is best known in Britain as a writer whose works feature dark content and quick wordplay. He co-wrote the horror spoof Doctor Terrible’s House of Horrible alongside Steve Coogan as well as the sitcom Ideal. Faith Stealer is Duff’s first (and so far only) Big Finish audio, and his fingerprints are all over this story As the first writer since Robert Shearman to actually utilize the concept of the Doctor being in an entirely new universe with new rules, Duff introduces a variety of new faiths with new tenants and new messiahs (the pure capitalist religion, with the priest yelling about “FREE PROPHECY FORCES,” made me laugh). And more importantly, Duff does so in a way that, while gently needling organized religion, doesn’t outright mock it or deride it, as opposed to the hostile way Jonathan Morris did in Bloodtide. His concerns focus on extremism, not faith. Now, I hesitate to use the words “Python-Esque” or “Adams-Esque” because Monty Python and Douglas Adams are in a comedic league all their own. But I will say that Duff’s script definitely has moments that come very close to those lofty heights.The humor is quite evident from the beginning as the Doctor and Charley make up a religion on the spot (“We’re Tourists!”), the concept of a redemption vending machine, and the Doctor’s run in with the accident-worshipping Church of Serendipity and their patron Whoops the Great Neglector, as well as Charley and the Doctor “kicking the tires” of the 23rd Church of Lucidity as they shop for a new religion. The moments of terror are there as well, with C’rizz and the head of one of the Multihaven’s major faiths trapped in the endless hallways of the Accumulator and the lead up to the third act cliffhanger where Garfolt attempts to soothe and cure C’rizz of his nightmares with some…”radical therapy.” The humor stands out more than the horror, but Duff, under the direction of (say it with me kids!) Gary Russell, never lets the story get bogged down. The pace is brisk, though in a weird way it makes the entire story lack a sense of overall urgency. The lead-up to the final showdown is much better than the actual showdown itself, where McGann channels a bit of Peter Davison to hastily dispatch the villain with a few choice words. 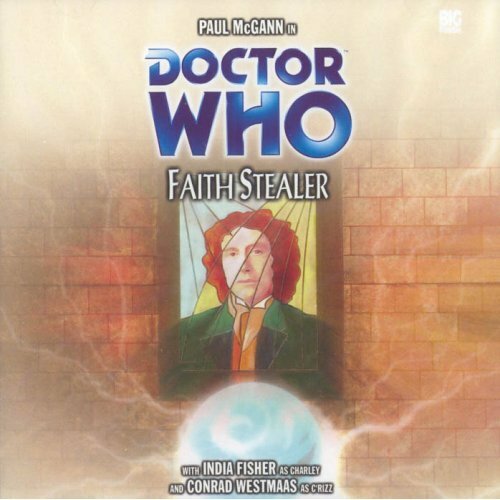 Speaking of McGann, Faith Stealer sees him give his most enjoyable performance in a long time. After the body horror of Scherzo and the “you might think I’m the Doctor, but I couldn’t possibly comment” role in The Natural History of Fear, it’s nice to hear the Doctor BE the Doctor once again. The Doctor is, after all, a madman with a box. We hear the Doctor’s desperation in McGann’s voice as he tries, time and time again, to track down the familiar noise of the TARDIS, always just seconds from finding her once again. We hear his anger as he confronts Carder and the deity he serves. But more importantly, the listener hears the Doctor having several spots of fun. One of the things I love most about the Doctors, all of them, is their ability to find the humor in nearly anything, be it slapstick, wordplay, or even gallows humor. The humor in Faith Stealer might be hit-or-miss to listeners, but McGann is at least having some fun with the role of the Doctor after the grimness of his third season. On the other hand, Charley Pollard is in Faith Stealer solely as the proverbial “girl who hands the Doctor the test tubes.” India Fisher really isn’t given much to work with in this story. Charley mostly comments on what’s going on around her, but aside from being choked by C’rizz doesn’t really contribute to the story. Luckily, this is more than made up for in the next serial, The Last. But that doesn’t help much here, and it’s not a case of “too many people in the TARDIS.” It’s just a lack of focus on Charley and not giving her anything to do this time out. A man much wiser than me made an interesting statement regarding C’rizz a few days ago. “C’rizz is Adric 2.0,” he proclaimed with wide-eyed terror. While I wouldn’t go THAT far, C’rizz up to this point has been a blank canvas, not being given much characterization over his three adventures with the Doctor. Faith Stealer finally shines the light on the alien, kicking off his character arc after all these months. This should have been the story to follow The Creed of the Kromon as we finally get a peek into his life. Even as he is weighed down by the guilt of mercy killing his wife, C’rizz seems more relaxed and a little more jovial around the Doctor and Charley. This change in behavior is one of the main story arcs going through the fourth season, and we begin to see snippets of C’rizz’s past. He mentions being a member of the Church of the Foundation, who’s tenants are not to be found in the Multihaven…and that’s about it, which is very strange in a play about religion! As he is being “cured” at one point, listeners get to see his self-doubt and psychological scarring at his wife’s death; was it truly merciful or the sign of something deeper? Sadly, this character arc gets jammed into four serials instead of over two seasons, so it does come off as a bit rushed. It’s a good performance from Conrad Westmaas as C’rizz, though, which at least holds some promise for the rest of the season. Faith Stealer benefits from a strong supporting cast. Christian Rodska is a prolific British character actor, and his turn here as Laan Carder, the leader of the Lucidian faith, is very solid. He’s what you expect as the head of a religion that focuses solely on obtaining new followers – charming, but slightly off-putting. Minor miracles abound but anything more concrete requires someone to meet with him one-on-one, where the truth of his religion and its methods of conversion can be told. Tessa Shaw is another well-traveled British actress, who starred as a UNIT officer in the first Third Doctor story, Spearhead from Space. As the Bordinan, she’s the one responsible for keeping the various religions in check, revoking the license of those faiths who stir up trouble. She is stern, but fair, and realizes just how absurd her job can be at times. And Ifan Huw Dafydd (Welsh, or Doctor Who alien race? You decide!) is also a seasoned performer, who gives his best as the pompous Bishop Parrish. His airs of importance quickly vanish as he’s confronted with the Lucidian “god” and becomes a quivering, faithless mess as he and C’rizz attempt to escape its grasp. As per a story about religion, we get a soft, soothing score from Russell Stone that doesn’t really stand out, but sits in the background, unobtrusive. Which, in a way, makes sense. The Multihaven comes alive under the work of Gareth Jenkins, with the bustling nature of the city mixed in with the conversations and shouts of various religions. The sounds of the misfortunes befalling the Church of Serendipity could have come directly from a Three Stooges short and I wouldn’t have even noticed! The concept behind the Lucidian’s object of worship is a neat one – psychic energy that fell between the cracks of the universes and seeks to obtain a physical form by stealing dream residue from its sleeping followers. But it’s not truly explored, explained, dismissed, and defeated by the Doctor with a few choice words. The “villain” is a great concept, but really needed time to develop and become more of a threat, as opposed to simply acting through the slimy Carder. This is a very good example of Faith Stealer’s major shortcoming. Ideas are put out there, but never developed or concluded in a proper manner. Duff touches upon the Divergent Universe and its concept of multiple religions, but not in enough of a fashion to truly set the story IN the Divergent Universe. 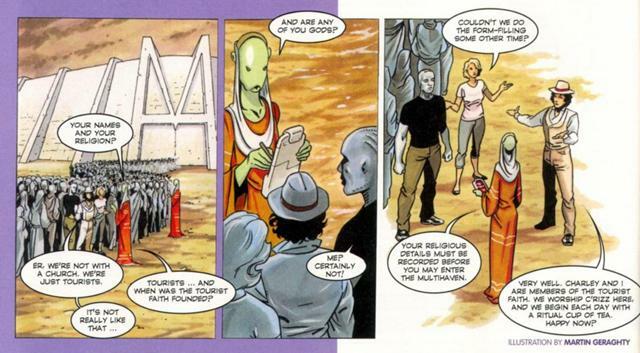 With just a bit of tweaking, Faith Stealer could have been easily set in the “normal” universe, where religion is examined the same way tax rates were in the Fourth Doctor story The Sun Makers. Not only that, but after going through the Interzone and seeing how this universe is divided up…where do all the pilgrims to the Multihaven come from? Are there towns out there? More cities? Do these faiths even HAVE a “home base” like the Vatican or Mecca? If so, then the Doctor should have been all over the idea after bouncing from zone to zone, but it’s never brought up and never discussed. As the fourth season progresses, we begin to get answers to some of the questions the Divergent Universe arc has brought up, but this story would have been the perfect place to define and hone both the questions AND possible answers. In the end, however, Faith Stealer is simply a harmlessly entertaining story, and that’s really what this fourth season needed. The third season was all downhill after Scherzo and while there was much more that could have been done with both C’rizz and the concept of the Multihaven, and the humor might not suit every listener’s taste, in the end Big Finish delivers exactly what the Eighth Doctor needed; a solid Doctor Who adventure. Paul McGann is the Doctor in…The Last. This entry was posted in Big Finish Review and tagged 4/5, Big Finish, Big Finish Audio, Big Finish Review, C'rizz, Charley Pollard, Conrad Westmaas, Doctor Who, Doctor Who Audio, Doctor Who Review, Eighth Doctor, India Fisher, paul mcgann, TARDIS. Bookmark the permalink. Ah, ‘Faith Stealer’. Personally, this is one of those I think more fondly of than I should. It’s a harmless little adventure with a fun sense of satire (the comment about ‘the spoon’ always brings a chuckle to me), so it’s still good, but… Coming in the midst of the dragging pointlessness that is the Divergent Universe saga (I would be so bold as to call it the ‘Trial of a Timelord’ of Big Finish’s run; a grand idea that fell flat on its face), a fun runaround is exactly what was needed. Unfortunately, like the majority of the Divergent Universe stories, this one doesn’t have any qualities that put it outside our reality. Personally I always found ‘Time Works’ had that quality the best… which is a pity as it comes after the Divergent storyline! If I am going to add a bit of criticism to this story, it would be one I have with a lot of Doctor Who stories: the ‘red shirt’ effect. Secondary characters introduced in DW serials are a bit too expendable for my taste, as if writers are afraid the characters may reappear if they don’t finish them off by the end of the story. I don’t think as many characters need to be killed off to increase tension, and Faith Stealer’s falling into that trope just annoyed me. As far as Charley goes (yes I’m on a tear here; I’m a first-time commenter, but I tend to lose myself in comments :p), I find her arc interesting and yet frustrating. After a while traveling with Eight, she kind of loses the spirit that made her character so loveable. She becomes a standard companion (with some exceptions, of course). I felt that the choice to move her to another Doctor (did her insurance cover that?) was inspired, as it really did reinvigorate the character and reminded me why I liked her so much in the first place! Err, sorry for the secondary review ^^; This started with a point, and I think I got lost in commentary. Keep up the good work! Thank you for the kind comment/mini-review! I like linking the Divergent Universe arc to the Trial of a Time Lord. A grand idea that just didn’t get executed properly. Some of the upcoming stories for Eight, including Time Works and Memory Lane, were supposed to be in the DU but got moved back into the “normal” universe…probably for the better! I know what happens to C’rizz, and while I appreciate what the writers tried to do with him, I’m ready for him to go so they can get back to Eight and Charley for a bit before she leaves. The pair of them together just clicked so well even in the weakest of serials, which is why I was so happy to hear them together in The Light at the End.